He’s a gerontologist; she’s a former Montessori teacher and administrator. 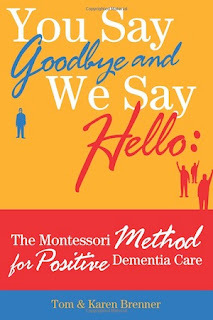 It was only a matter of time until they merged their talents and developed the Montessori Method for Positive dementia care. They use the Montessori Method in cutting-edge ways to support memory function and improve the quality of life in aging populations. Together they train family members, professional caregivers and medical staff in the use of interventions for persons who have dementia and Alzheimer’s. The Brenners use the Montessori Method as the foundation for their evidence-based memory support program. This program uses the five senses, muscle memory and spiritual engagement to maintain connections for persons with memory loss. At their numerous speaking engagements over the past few years they were always asked if they had a book detailing their approach. They didn’t. So they finally realized they needed to write one. And here it is. It was just published in February of this year. The authors state that oftentimes, when friends and family hear the words “Alzheimer’s and dementia” they react to the news the same way they deal with death. But the Brenners tell us that we are the ones who have to assure them that the dementia journey is not about death, it is about life. The Brenners share the stories of people living with dementia they have encountered during their years of experience in this field. Even more importantly, they describe in detail the techniques and tools they have developed to help readers stay connected to the people they love. Tom and Karen also give numerous illuminating examples of how they have used their tools and techniques to reach specific individuals with dementia, even those others have considered unreachable. This book is a true inspiration to dementia caregivers everywhere. And at their presentations now when they’re asked if they have a book, they say “Yes.” And a marvelous one it is. Karen Brenner is currently a writer and consultant. She is a frequent on-air contributor to WBEZ, Chicago Public Radio and the winner of the Professional Journalists’ Peter Lisagor Excellence in Writing Award. Thomas Brenner is an educator and researcher for the Illinois Department on Aging, in Chicago, where he instructs caregivers, case managers, and medical staff in best practices for elder care and conducts research on brain fitness, Alzheimer's, and dementia. In 2010, he received the Good Samaritan Award from the Red Cross. Tom and Karen are the founders of Brenner Pathways a consulting firm offering Montessori-inspired brain fitness strategies for people living with Alzheimer's and dementia. They are regular contributors to the Alzheimer’s Reading Room and The Fisher Alzheimer’s Research Foundation Blog. Marie Marley is the author of the uplifting, award-winning book, Come Back Early Today: A Memoir of Love, Alzheimer’s and Joy. To learn more about Marie and to accesss her wealth of information for caregivers go to Come Back Early Today. Original content Alzheimer's Reading Room.